Custom printed Luncheon Napkins are the next size up from Beverage Napkins and Cocktail Napkins. The 6.5” x 6.5” folded Luncheon Napkins are a powerful branding tool! It’s a napkin with a boost. These personalized napkins are a great substitution for wedding napkins, monogrammed napkins, and dinner napkins. 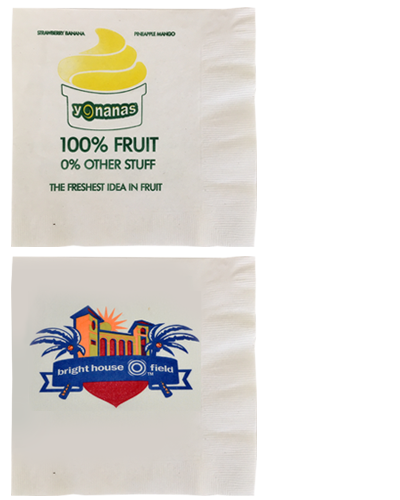 These printed napkins have a large surface area perfect for allowing your logo to be bigger than it’s smaller predecessor. Luncheon Napkins allow you to convey your message in a bright and dynamic fashion. This style napkin is available in white with a 4 color max spot PMS print capability. 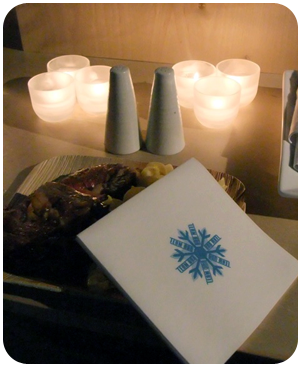 Our Custom Printed Luncheon Napkins are the perfect branding tool for any event! How many Luncheon Napkins do I need to buy for a custom print? The minimum order requirement for custom printed Luncheon Napkins is 12,000 pieces. Gator Paper’s small order size requirements eliminate your need for excess storage space! What is the lead time for custom printed Luncheon Napkins? Standard lead time for all custom printed napkin orders is 2-3 weeks. Rush orders are available for an additional fee when the production schedule allows. Transit time is typically 2-4 days for the East coast, and 5-7 days for the West coast. What are your printing paper napkin capabilities? Luncheon Napkins can be printed up to 4 spot PMS colors. We can match any PMS color on the chart and some metallic inks are available. What kind of artwork is required for custom printed napkins? Vector art files are preferred, and Adobe Illustrator, .EPS and high resolution PDF files work the best. If the line artwork is simple enough, sometimes a JPEG file will work. Bitmap images are not good enough quality for proof or plate making, and are not accepted. Need a price quote on custom printed Luncheon Napkins? Contact us today! Looking to replace those plain unprinted Dispenser Napkins with custom printed Dispenser Napkins..
Then look no further, you have found the #1 source for short run printed napkins in North America!